Hydrating facials that assist in plumping and healing the skin. They contain hyaluronic acid, gold particles, jojoba and evening primrose oils, silicon oil, extract of brown algae, vitamin E, amongst other ingredients. There are different types of Hydrating facials and we can recommend a specific treatment for every client depending on the skin type and condition. Skin firming and texture refining facials containing vitamins A, C and E, Aloe Vera extracts, hyaluronic acid, algae extract, papaya extract, lemon grass oil, blood orange oil, extracts of pomegranate, pineapple and currant, palma rosa oil and witch hazel. These carefully chosen and balanced ingredients give the skin elasticity, firmness and provide moisture. The skin texture looks more refined and glowing with a more clear and radiant complexion. The skin is smooth, soft and fresh! Ideal as a make-up base. Anti-ageing treatments include a wide range of different, collagen stimulating facials. Main ingredients in these facial include growth factors and extracts form plant stem cells (e.g. extract from Royal Grapes of Cuvee Prestige Champagne, France), marine plant extracts, caviar, plant oils and extracts, gold and platinum particles, Hyaluronic acid and more. Regular anti-ageing facials assist in building thicker and healthier skin, reduce the appearance of fine lines and superficial wrinkles, increase moisture levels in the skin, and improve skin firmness and elasticity. HOW OFTEN CAN I DO INNOVATIVE FACIALS? Innovative facials can be performed once every 2 weeks as an intense course, or once a moth as part of a skin maintenance regime. They can also be combined with aesthetic treatments like mesotherapy and/or laser/light and radio frequency therapy treatments in an individualised treatment protocol. HOW CAN YOU BENEFIT FROM INNOVATIVE FACIALS? Innovative facials are recommended for both women and men from the age of 25 years. There is no restriction to different skin phototypes. Most of these facials are pleasant and require no recovery time. Procedures take 45 minutes to an hour. 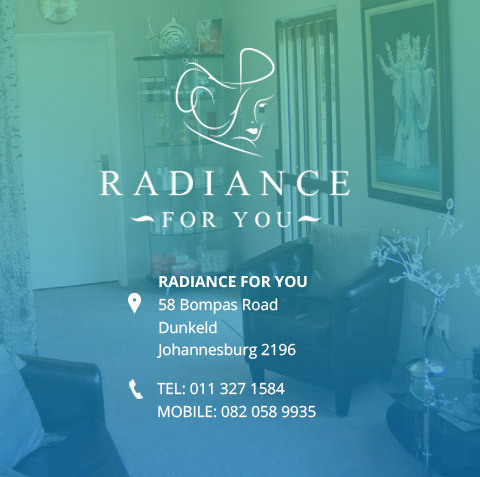 For more information on Innovative facials contact Radiance for You.